On Monday, President Poroshenko pledged to take Donetsk Airport back: "I have no doubt - we will free the airport, because it is our land. And we will rebuild the airport." 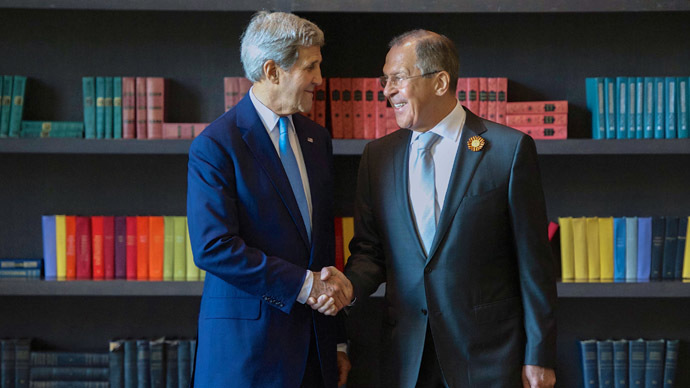 While Kerry and Lavrov admitted they didn’t always see eye to eye on Ukraine, they did agree that the Minsk agreement is the best way to solve the crisis and that diplomacy is the only way to peace. The diplomats urged everyone who has influence on any party in the Ukrainian conflict, to use it in a positive manner to ensure peace prevails. “I urge him [Poroshenko], as I urge the Russians today. Anybody who has any control over anybody needs to take every step possible, to fully implement Minsk and clearly this means preventing any breaches of activity in regards to the ceasefire,” Kerry added. For his part, Kerry added that sanctions against Russia would be rolled back “if and when” all the points of the Minsk deal are implemented in Ukraine. Marcus Papadopoulos, the editor of Politics First magazine, who spoke to RT said Washington is looking for a way out, or is at least trying to smooth relations with Moscow as they realize dialogue is the only option, as well as needing Russia’s help with regard to Syria and Iran. “I would agree that the American’s are acutely aware that the sanctions that they imposed on Russia last year have emphatically failed to achieve their objective, which was to decimate the Russian economy and bring Russia to its knees,” Papadopoulos told RT. Kerry held talks with Russian President Vladimir Putin, which lasted for over four hours, instead of the planned one and a half hours. This followed similarly lengthy talks with Lavrov, while the two diplomats laid flowers at a World War II memorial. Kerry and Putin focused on discussing bilateral ties, as well as several major international issues. Although Moscow and Washington didn’t totally agree on issues regarding Ukraine, Kerry and Lavrov both stressed they shared similar viewpoints on Syria, the threat of the Islamic State and the Iranian nuclear deal. The pair also discussed the developing conflict in Yemen. Moscow saw the meeting between President Putin and Kerry in a positive light, even though there was no breakthrough. A Kremlin aide, Yury Ushakov, mentioned the Russian president was interested in normalizing relations between the two countries. “As it was pointed out, this is what Russia wants and I hope this is in the interests of the USA as well. This is extremely important for the implementation of international stability and security,” Ushakov added, as cited by TASS. White house representative Josh Earnest said at a press briefing he thought the US and Russia can cooperate effectively, despite the serious disagreements between them. He pointed out a number of issues where cooperation is already taking place, including space exploration and the chemical disarmament of Syria.